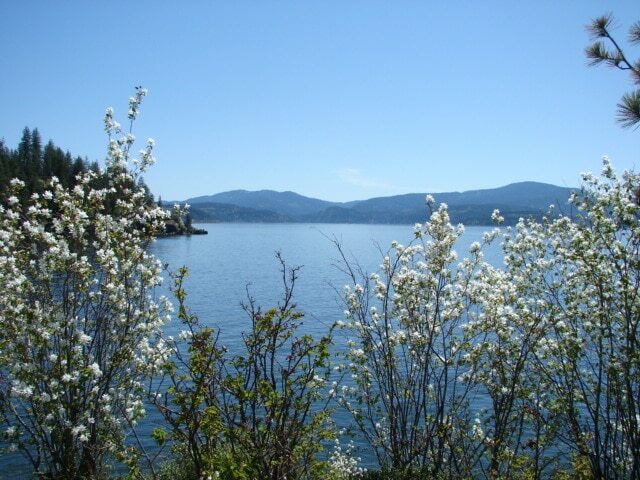 Lake Coeur d'Alene comes alive in the spring with an abundance of wildflowers and pristine lakeshore scenery. After a long winter season, the hiking and walking trails are ready to be explored. Near the town of Coeur d'Alene and within a short driving distance from town are dozens of scenic pathways to exercise or relax with a picnic lunch. Lake Coeur d’Alene comes alive in the spring with an abundance of wildflowers and pristine lakeshore scenery. After a long winter season, the hiking and walking trails are ready to be explored. Near the town of Coeur d’Alene and within a short driving distance from town are dozens of scenic pathways to exercise or relax with a picnic lunch. Lake Coeur d’Alene extends 25 miles through hilly woodlands with wide open waters. The golden sand beaches along the shore along with the wilderness scenery and water sport activities make this area a popular resort. Add that to the proximity of North Idaho College and the mix creates a lively city with gourmet restaurants, fun pubs and a full spectrum of seasonal outdoor concerts. A perfect day in Coeur d’Alene begins with a brisk morning walk. The longest floating boardwalk in the country is a short block from downtown and adjacent to the Coeur d’Alene Resort. Fishing and pleasure boats leave the harbor each morning and dozens of joggers and walkers take to the shoreline boardwalk. The soft sound of gentle ripples from the lake, the scent of cedars and flowering trees plus the views of crystal clear Lake Coeur d’Alene make this spot a perfect beginning. After a walk along the boardwalk, the adjacent City Park holds 16.5 acres of tree lined grassy areas, playgrounds (if the kids are along) and a popular swimming beach. The long, wide sidewalk meanders beside the lake and travels into quiet neighborhoods that offer views of historic cottages and lakeside estates with tulip and daffodil laden gardens. Bicycle rentals from the Vertical Earth Bicycle Shop add an alternative way to see the lake and get some fresh air exercise. When lunchtime arrives it may be hard to think about going inside on a beautiful day at Lake Coeur d’Alene. Fortunately there are many outdoor cafes that offer sandwiches and salads along the side streets that intersect with Lakeshore Drive. Or if a picnic sounds better, get a sub to go and head for another perfect walking spot, Tubbs Park. Tubbs Hill Historical Park covers over 135 acres and although technically a city park, it feels like the wilderness. The meandering trails provide the option of walking at a moderate pace along the shore or climbing to the hilltop to enjoy expansive vistas. Either way, the wooded pathways open to wildflower strewn meadows blooming in shades of purple, yellow and white. The lower trail offers access to the beach where picnicking on the rocks or sand creates a relaxing way to start the afternoon. Frequently the white head of a bald eagle appears on a barren tree along the shoreline. Spring in Coeur d’Alene also brings back colorful robins and bluebirds and Tubbs Park is alive with the scents and colors of the season. After a full day of walking or bicycling, a few hours spent relaxing by the water is a welcome relief. The Coeur d’Alene Resort offers lakefront rooms and outdoor patios. The Boardwalk Bar is an open air retreat that serves cool beverages at its location adjacent to the marina. With a few hours left before the dinner hour, a short walk downtown leaves enough time to visit the many fashion boutiques, art galleries and jewelry stores that line Sherman Ave. The longer evenings in northern Idaho bring everyone from long time residents to tourists and families out for dinner in town and a stroll. Restaurants abound on Sherman Avenue and the Wine Cellar, among others, offers Mediterranean cuisine and live jazz. The Cedars Floating Restaurant at the Coeur d’Alene Resort is a fun place that gives unchallenged views of the water. After dinner take a walk along the boardwalk and watch the dinner cruise boats arrive. A warm spring day in Coeur d’Alene warrants being outdoors. An abundance of walking or biking paths, plenty of places to rest in the shade and the pristine beauty of Lake Coeur d’Alene make this spot a delightful place to enjoy the essence of spring. The combination of the love for travel and the joy of writing combine to make the ideal lifestyle for Kathryn Hedderig. After spending many years working for a large corporation, her time is now spent enjoying pleasant days on the road and quiet times at home compiling the stories that bring smiles and lasting images to life. Kathryn’s published articles have appeared in various national newspapers, websites and travel guides. She lives with her cherished husband in Arroyo Grande, a small coastal city in central California’s wine country.